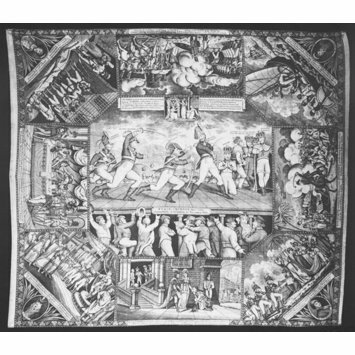 Yellow cotton handkerchief plate-printed in red, and depicting the state of Europe in December 1812 with captions and commentary in both English and German, and scenes from recent political history. In the centre is a stage on trestles, on which Napoleon is being attached on the left by figures representing Sweden and Russia, and on the right by Prussia. Behind Prussia kneels crowned Jerome and on the right is a group of four crowned figures representing Austria and the Confederation of the Rhine. On the front of the stage is a label inscribed 'Stage of Europe Decr 1812 / Europäische Schaubühne in December 1812'. Many figures in front and behind the stage. 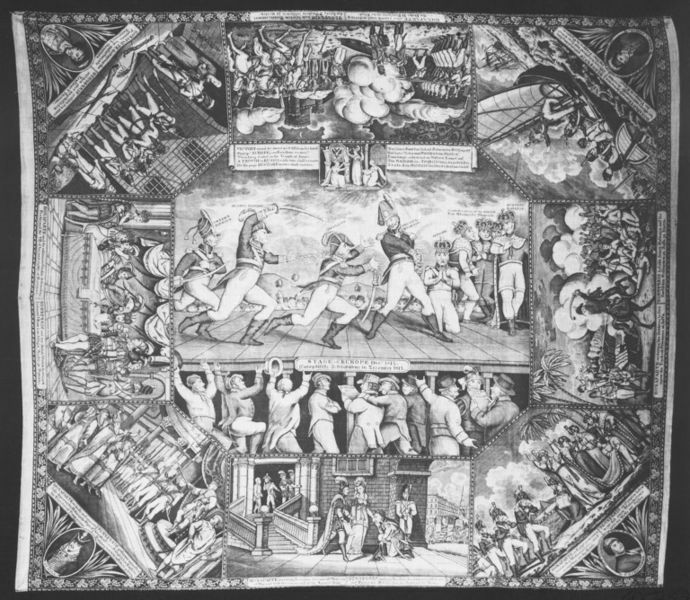 Napoleon depriving the Pope of his territorial possessions; Napoleon receiving Josephine, the cast off mistress of Barras; Napoleon in Egypt; Bonaparte ordering his soldiers to fire upon the Turkish prisoners at Jaffa; Bonaparte betraying his officers and deserting his troops in Egypt; Bonaparte after a mock trial ordering the Duke of Enghien to be shot; Napoleon destroying the patriots; Napoleon and Godoy defrauding Ferdinand VII. At the four corners are portraits of Schill, Cristophe, Herman Friese and Hoffer. At the top of the centre panel is a cartouche with the figures of Europe, Victory and History and a verse in German.